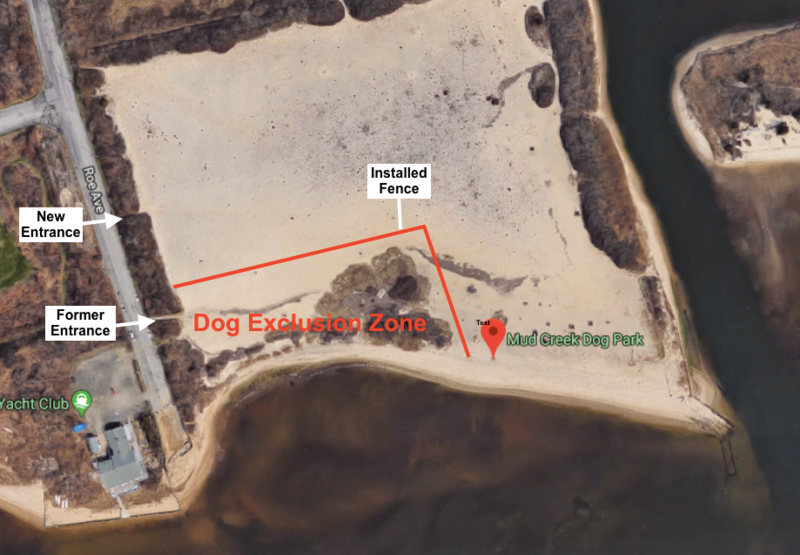 A long line of fencing that creates a dog-exclusion zone has gone up at Mud Creek County Park–Long Island’s ONLY official off-leash beach–in E. Patchogue. The fencing, which appeared on May 1st and runs approximately 530 feet, cuts the beachfront available to dog owners and their pups in half. Mud Creek’s off-leash beach was created for dog owners in August 2009 as a result of the Five New Dog Parks bill passed unanimously by the Suffolk County Legislature in May 2007 and in response to Suffolk residents’ requests for safe places to exercise and socialize their dogs. At this time, Mud Creek is the only official Suffolk County off-leash beach. “To take away so much of this singular resource for dog owners and their pups without even consulting us is not fair,” said Ginny Munger Kahn, president of LI-DOG. “It would be like creating a soccer field for kids and then suddenly taking half away for adult recreation. Dog owners are upset,” she noted. What You Can Do: Let local elected officials and Parks Dept. officials know what you think about creating a dog-exclusion zone on the ONLY off-leash beach on Long Island. (See contact information below.) To spread the word and increase our impact: Download the Mud Creek Petition and Mud Creek Petition Signature Form, sign the form, and share it with your dog-loving family and friends. “Dog owners are willing to share park resources,” said LI-DOG’s President, “but this is the ONLY official off-leash beach in all of Suffolk County. By contrast, local residents who do not wish to come into contact with dogs have multiple, beautiful beaches available to them nearby and throughout Long Island,” she noted. Leg. Calarco also discussed alleged complaints from neighbors about loose dogs leaving the park in an April 2016 Suffolk Legislature meeting. In a March 2016 Long Island Advance article, neighbors suggested a fence to close off the dog park from the road. However, the new fence does not prevent dogs from leaving the park, but instead cuts across the first half of the beach to create a dog-exclusion zone. In addition to dividing the beachfront in half, the new dog-exclusion zone creates a new entry point for dog owners. The new gated entry is further north on Roe Ave and requires dog owners and their dogs to traverse all 530 feet of fence line and sand before being able to access the waterfront. Not only does the sand get quite hot during the summer, which is tough on animals’ paws, but broken glass has often been found in this large stretch of sand, thereby putting dog owners and their dogs at increased risk of injury. It would also be a bad idea to extend the fence line into the water. If a dog swam around or dug under the loose sand under the fence, dog owners would not be able to quickly rescue their pets raising the potential for serious harm to their dog. Since 2009, local dog owners have worked voluntarily to clean up and maintain the beach at Mud Creek. The site formerly was used by the Town of Brookhaven to dump recycling and dredge waste. This waste material–glass and other trash–is regularly uncovered by wind and water action. Dog owners including LI-DOG have worked diligently over the years to organize clean ups and clean up the beach themselves. “Here we’ve done all these cleanups and now that the beach is nice, the results of our work have been taken away and turned over to those who were not involved in the beach’s transformation,” said Janie Dill, another dog owner who frequents Mud Creek. “We need a solution that takes into consideration dog owners’ care and concern for this park,” she said. It’s time for dog owners to stand up and protect the off-leash beach at Mud Creek. Please call, email or write Leg. Calarco and let him know what you think about creating a dog-exclusion zone on the ONLY off-leash beach on Long Island. Ask Leg. 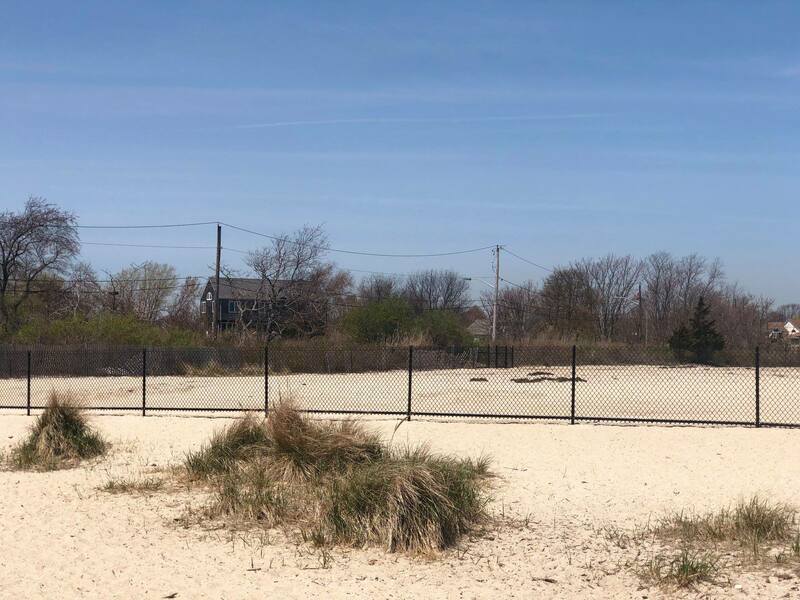 Calarco to work with LI-DOG and local dog owners to come to solution that preserves the off-leash beach the County created at Mud Creek Park and that meets the needs of Suffolk dog owners for a safe, comfortable, and practical off-leash area. Don’t forget to include your address, especially if you’re a resident of District 7, which includes Patchogue, Medford and Middle Island, or are a resident of Suffolk County. This is a beach for ALL Suffolk residents after all. Remember: Calls are the easiest, but most powerful way to send a message! Please always be polite. Want to volunteer to help us gather signatures in District 7 specifically? Email us at news@lidog.org and we’ll put you in touch with our organization team! To keep up-to-date on what’s happening at Mud Creek, check back here or the Mud Creek Dog Park Facebook Group. Thank you for your help and support for the Mud Creek Off-Leash Beach!